The Nano-CarboScavenger project supports three of iSEE’s research themes: Energy Transitions, Sustainable Infrastructure, and Water & Land Stewardship. “As the demand for petroleum continues to rise, we will see an increase in petroleum transportation traffic — which will inevitably lead to an increase in chances for aqueous crude oil spills, land spills, and fracking byproduct-based pollution. These spills threaten our environment, and finding ways to clean them up has become a grand world challenge. “But thus far, we lack efficient and safe cleanup methods for oil and petroleum spills. Typically, oil spills can affect animals and plant life in two ways: from the detrimental effect of the oil itself, and from the treatment for cleanup operations. Addressing both these challenges can help us minimize overall impacts to the ecosystem and facilitate a much quicker recovery. “In response to this ecological threat, my team has developed a highly efficient, environmentally friendly, bio-digestible, and commercially amenable powder dispersant. This tiny, nanometer-sized agent is uniquely “dual functioning” — for simultaneous collection and removal of crude oil and petroleum distillates with remarkable efficiency. More importantly, this agent does not leave any residual footprint because it is degraded in the environment and in living systems — and any incidental biological uptake is not harmful to living organisms. “Our reusable Nano-CarboScavenger powder dispersion leads to clumping and accumulates the oil for simple recovery by nets or booms. That makes our approach distinctly different from current approaches and introduces an ecologically compliant strategy for oil spill remediation. This filter is vastly different from your average water filter. Instead, it places activated charcoal and sand on top of the PNCs, which are carbon-filled cores made from agave. Water is allowed in, the activated charcoal removes heavy metals, the sand helps remove impurities and contaminants, and the PNCs scavenge through the water to remove the PPCP pollutants. “Apart from oil remediation, the next work we have done is on chemical contaminant removal using these nanoparticles, and a manuscript has been submitted for publication on that work,” he said. The article, titled “Biodegradable NanoCarbon-based Smart Filters for Efficient Remediation of Pharmaceutical Contaminants,” has been submitted to Journal of Materials Chemistry A. “Also, we are looking at potential of using these nanoparticles as lubricant additives in lubricants, such as engine oil, hydraulic oils, etc.,” Sharma said. PI Dipanjan Pan and other team members in Bioengineering continue to look at the nanoparticles’ biomedical applications, including cancer treatment. Oil-contaminated seawater samples were treated with NCS for six time point measurements over the duration of eight days. Triplicate measurements of total organic carbon (TOC), fluorescence spectroscopy (EEM), and Acute Toxicity by MicroTox were performed at each time point. The team extracted non-polar organics at select time points and analyzed extracts by gas chromatography mass spectrometry (GCMS). Addition of NCS material to seawater with and without contamination increased the dissolved total organic carbon (TOC) contained in the water fraction. The team confirmed that addition of NCS material to contaminated seawater had no significant effect on acute toxicity of the water fraction as determined by MicroTox. Nor did addition of NCS material to seawater alone. The addition of NCS material to contaminated seawater reduced the fluorescence intensities of the three components in the dissolved water fraction. The maximum difference occurred on Day 3. Quantitatively, the addition of NCS material to oil contaminated seawater shows a ~40% reduction in the total petroleum hydrocarbon (TPH) content in the dissolved water fraction. Using the NCS platform technology, a novel “smart water purification system” for remediation of pharmaceuticals, hormones, polyaromatic hydrocarbons and other contaminants was also developed. Several batches of second-generation NCS samples were successfully tested in Wei Zhang’s lab at the Illinois Sustainable Technology Center for their activity in removing pharmaceuticals. “We also developed mineral-rich algal nanoparticles from biomass (algae) for biomedical application,” Pan said. “Spheroidal nanoparticles of algal (phytonic) origin were synthesized comprising carbonaceous architectures and surface-rich oxygenated functional groups.” In two back-to-back publications in ACS Applied Materials and Interfaces (see publications below), the team reported that nanoparticles derived from algal biomass exhibit intrinsic anti-migratory properties against cancer likely due to the rich abundance of α-amino acids. The Crude Oil Pollution Treatment Project team recently published a paper announcing its work on the Nano-CarboScavenger (NCS), which promises an environmentally friendly solution to aquatic oil spills around the world. The NCS powder simultaneously diffuses oil floating on the water’s surface for natural breakdown and absorbs oil and traps it for easy removal. Pan recently reported results in an article in Nature Publishing, a publication of Scientific Reports. Most methods for oil cleanup today rely on releasing toxic chemicals into the ecosystem, but the NCS particle leaves fish and other aquatic life, as well as humans, unharmed. In laboratory tests, researchers removed more than 80 percent of oil contamination they introduced into water samples by sprinkling NCS powder across the surface of the water and scooping out clumped oil. The total cleaning effect will be even higher in natural bodies of water, where millions of microorganisms can gobble up oil molecules NCS particles disperse into the water. The team’s manuscript on Nano-CarboScavengers rehabilitating petroleum-contaminated water has been reviewed twice with Nature Communications, and another revised version is ready to be submitted. Significant research progress has been made — and key data collected — to take the project beyond the level of proof of concept. New student members have been added to the team (see those updates below). “Utilizing our platform technology based on carbon nanoparticles, we are proposing a novel ‘smart water purification system’ for remediation of pharmaceuticals, hormones, polyaromatic hydrocarbons and other contaminants,” Pan said. A second project is looking at production of mineral-rich algal nanoparticles from biomass (algae) for agricultural, biomedical and environmental (metal, e.g. mercury scavenging) application. “A third spinoff project is looking at a self-‘reproducing’ bacterial-nano-enzyme architecture for novel solution of biofuel production,” he said. 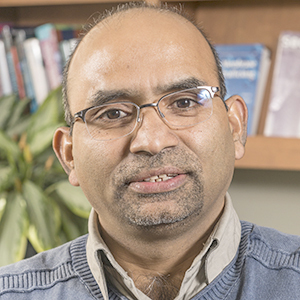 Dipanjan Pan, Associate Professor of Bioengineering (in team photo).His departmental page.His Laboratory for Materials in Medicine page. His Beckman Institute page. B.K. Sharma, Senior Research Engineer at the Illinois Sustainable Technology Center (ISTC) (in team photo). His ISTC page. John Scott, Senior Analytical Chemist at ISTC (right). His ISTC page. Indu Tripathi, Postdoctoral Visiting Scholar in Bioengineering (in team photo). Her Pan Laboratory page. Fatemeh Ostadhossein, M.S. Candidate in Bioengineering (in team photo). Her Laboratory for Materials in Medicine page. Zhaolu Wang, M.S. Candidate in Bioengineering (in team photo). Wei Zheng, Senior Research Scientist, Illinois Sustainable Technology Center (ISTC). His ISTC page. Yao Shi, Professor of Chemical and Biological Engineering, Zhejiang University, China. His Zhejiang University page. Yi He, Associate Professor of Chemical and Biological Engineering, Zhejiang University, China. His Zhejiang University page. Publication: “Biodegradable Nano Carbon based Smart Filters for Efficient Remediation of Pharmaceutical Contaminants.” Tripathi, I.; Dodgen, L.; Ostadhossein, F.; Misra, S.K. ; Daza, E.; Sharma, B.K. ; Zheng, W.; and Pan, D. Journal of Materials Chemistry A (2018). Publication: “α-Amino Acid Rich Photo-phytonic Nanoparticles of Algal Origin Serendipitously Reveals Anti-migratory Property against Cancer.” Misra, S.K. ; Schwartz-Duval, A.S.; Ostadhossein, F.; Daza, E.A. ; Saldivar, Z.M. ; Sharma B.K. ; Pan D. American Chemical Society Applied Materials & Interfaces (June 2017). Publication: “Nanosalina: A Tale of Saline-Loving Algae from the Lake’s Agony to Cancer Therapy.” Ostadhossein, F.; Misra, S.K. ; Schwartz-Duval, A.S.; Sharma B.K. ; Pan D. ACS Applied Materials & Interfaces (March 2017). Presentation: First place (oral), Daza, E., and Misra, S., Materials Research Lab (2015-16). Presentation: Second place (poster), Daza, E., and Misra, S., Center for Nanoscale Science and Technology Poster Symposium in the Micro and Nanotechnology Lab (2015-16). Presentation: First place (poster), Daza, E., and Misra, S., Bioengineering Days Poster Symposium in the Digital Computer Lab (2015-16). Presentation: First place (poster), Daza, E., and Misra, S., Annual Society of Postdoctoral Scholars Poster Symposium in the Beckman Institute (2015-16).